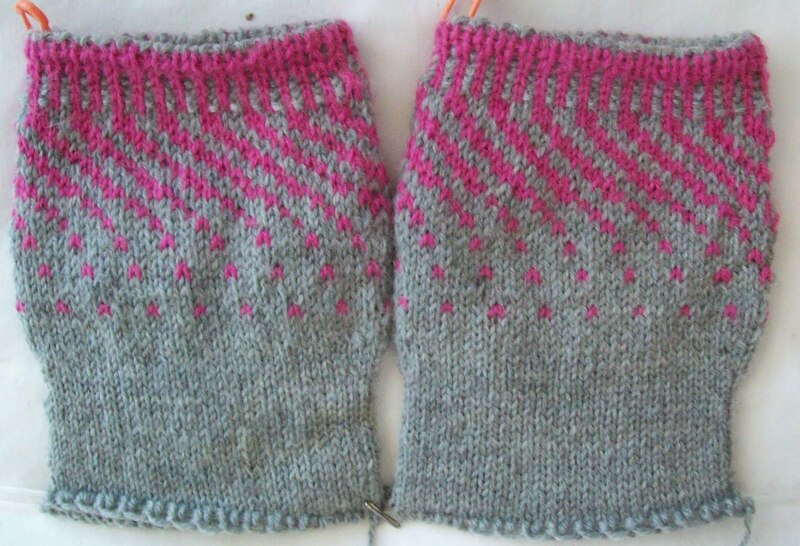 Several years ago, (August '06) before I started to blog, and long before I was on Ravelry, I made these sock. They are made from Paton's Kroy sock yarn—and a bit of left over baby wool (from a bag of odd balls of yarn)that was also super wash. I made the cast on too tight. The socks fit over my heel (with a struggle) –--the top edge has no stretch at all. They are shorter than my average sock—with no stretch, they had to be. I wear them--it's a testament to the sock yarn,(--and to having now 50+ pairs of sock)—that they look so good still. 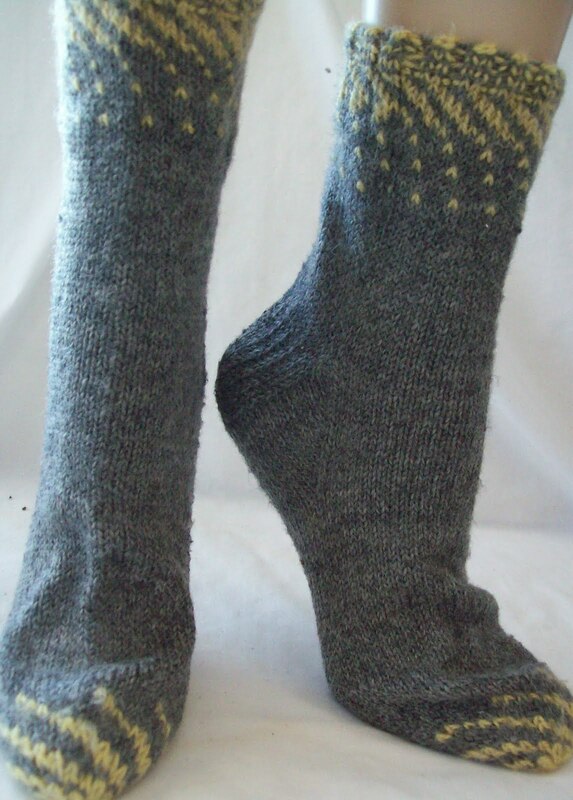 Once monthly wearings, means a 4 year old pair of socks has likely only been worn 3 or 4 dozen times. I think these have been worn slightly fewer times than average—the cuff is tight, and the leg is short, so they are 2nd class socks. One reason I do wear them, is I like the design! So, now, a new improved repeat is being knit. A different cast on (tubular), a different rib, (1 X 1, two color) and a slightly different swirl pattern (it's longer) and I am well on my way to a new pair of socks—I am ready to start the heel flap! The grey is a lighter shade, the pink is a long discontinued color (also Kroy). The fit (and stretch of cast on edge) is dramatically improved. And even thought I really like these socks, progress will slow down dramatical—I have 2 pieces of fabric crying for attention—a chocolate brown twill and a brick-red even weave. So some new skirts will be heading my way—I think it's the colors more than anything that has me listening to the fabric. I like dark brown (it's a becoming color on me) and it seems so fall like. Same goes for the red—and while I have lots and lots of clothes (and did make 4 skirts this summer!) I haven't bought much in the way of new clothes in a few years now.. The summer of '09 I splurged on 11 man tailored shirts –at $3 (yes, three, not thirty, dollars each) but new skirts—in colors (not denim blue) are something to enjoy. And, in a bit of reverse engineering, I have several pairs of socks that are partly or predominately brown, and a few pairs of socks with just the same shade of red. So I can make skirts to match socks as well as socks to match existing clothes. Let's pretend, for now, that I do! LOVE the swirl pattern on the raspberry swirl socks! That pattern is so pretty! I know what you mean about clothes. I just purchased two new pairs of jeans in the past month and realized that in terms of clothing, most of the rest of my wardrobe is years old. Not really feeling bad about that. It's just surprising.